Lately we have been gearing up and trying to find the early vegan spring produce – so excited it’s spring! Our first trip to the farmers market was two weekends ago in South Bend, Indiana, USA. Unfortunately there was not much there from local farmers but FL definitely is making some bucks right now on the Eastern Coast. With that said, I want to share some of the meals we have been devouring lately thanks to the inspiration of fresh produce. 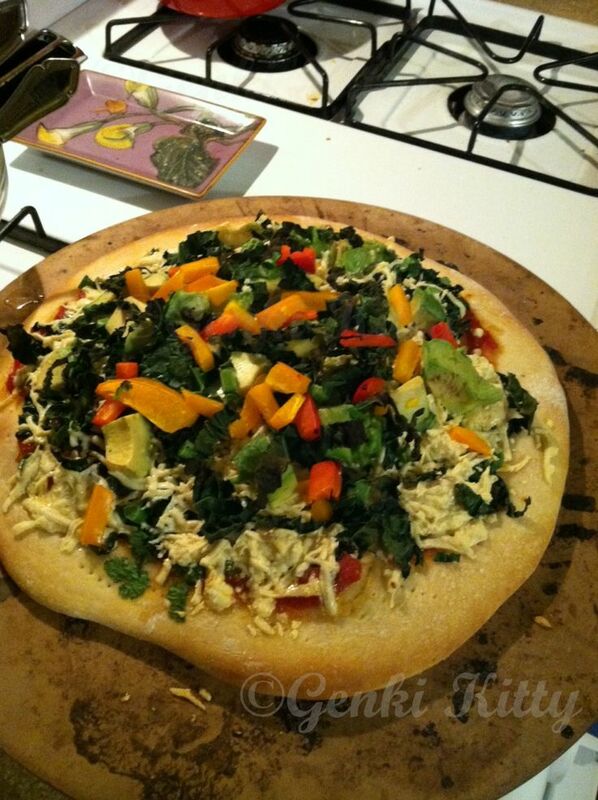 Daiya vegan cheese was available at Whole Foods Market the other day for $1 off – so we knew we had to make vegan pizza. Yes, pls! This was super easy to make the dough in the morning, leave it all day while I worked and then put the pizza together after returning from the gym. You can make homemade and still be active – you just have to plan ahead. 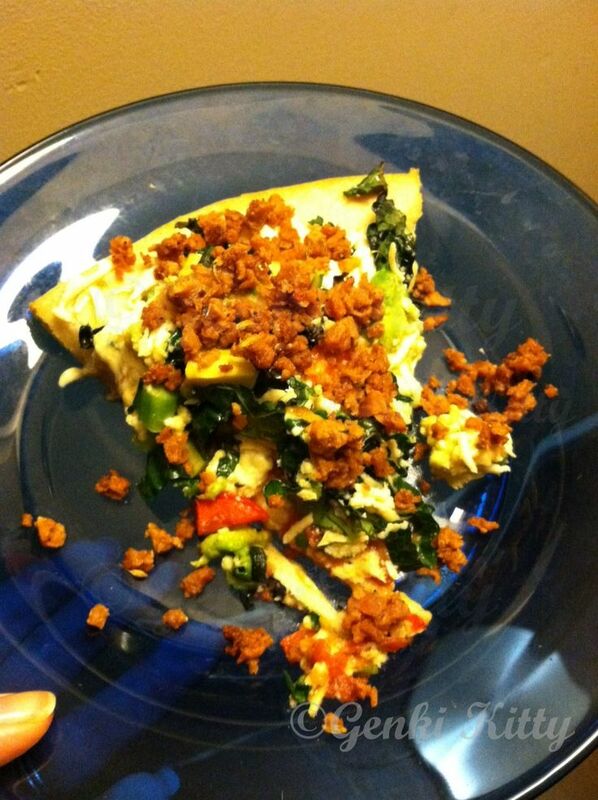 This was made with my homemade pizza dough, kale, zucchini, onion, tons of garlic, homemade pepperoni and daiya cheese. So delicious!!!! Genki Husband sometimes has a bit of work to do at night so we tend to go to the gym with a packed bento for two people. We eat in his office and then he can work afterwards. It saves on fuel, saving the planet. This was vegan chick’n strips seasoned with cajun seasoning and fresh garlic, Ezekiel sprouted tortilla (which I love, G.H not so happy with because they fall apart easily), and finally a bowl of peppers, onions more garlic and some soy sauce. Then we just assembled everything together. Faijtas that I made on the fly one day for lunch while working from home. 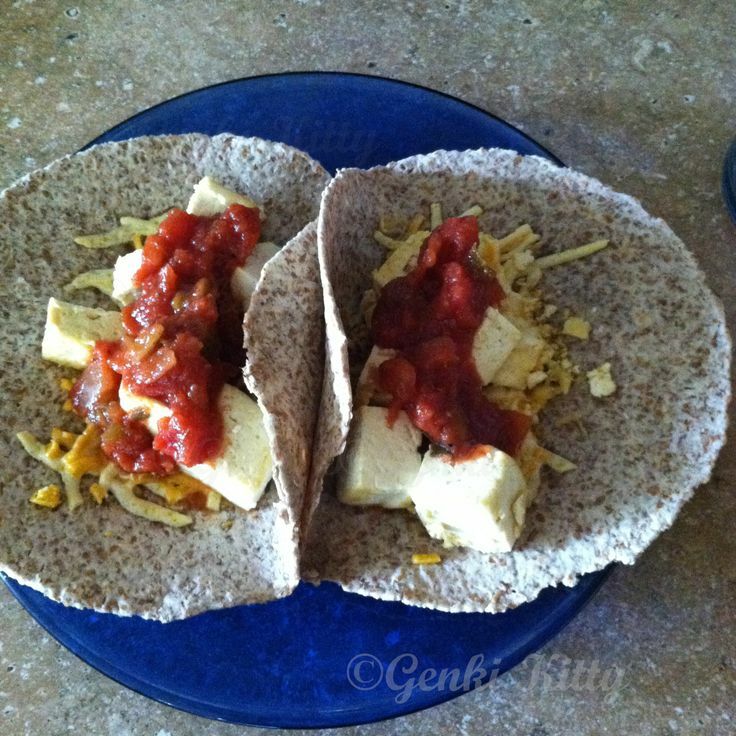 This is seasoning with cajun seasoning tofu, daiya cheese, and salsa. The tortillas are Sprouted whole grain tortillas. I love these tortillas because they taste like bread. For the first time I made Kutia, made with wheat berries. These wheat berries were bought from the bins at Whole Foods Market, the only place I have found them sold. 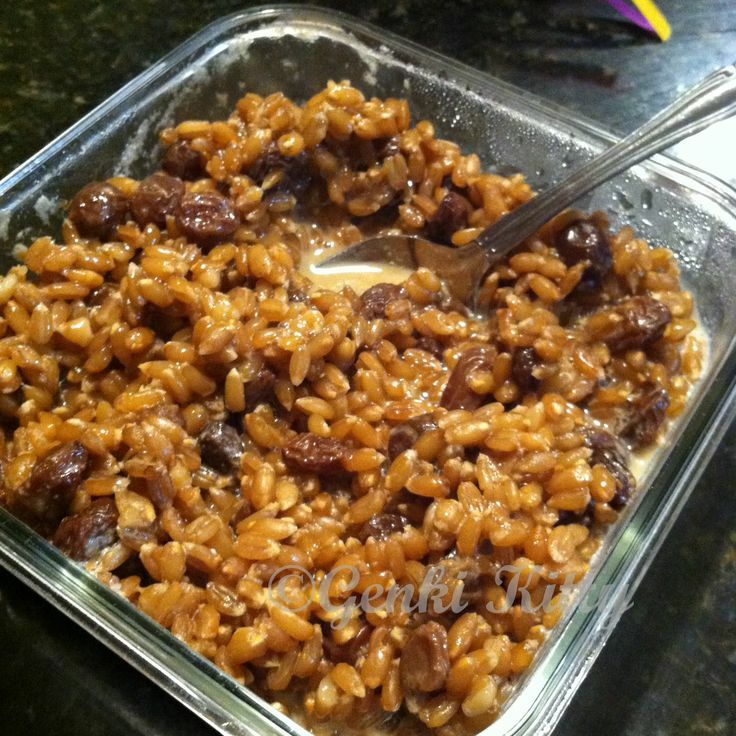 Genki Husband loved this recipe, it’s a lot like oatmeal but different nutrients. I think I should have cooked the wheat berries a bit longer though, you can see the white at the ends. 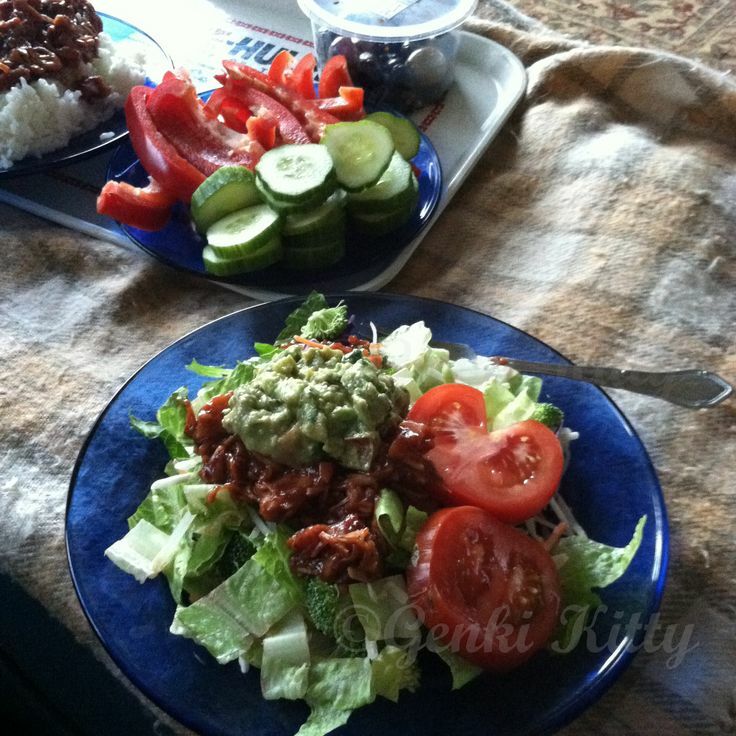 This is a BBQ salad that I made for dinner one night from a recipe on Pinterest. 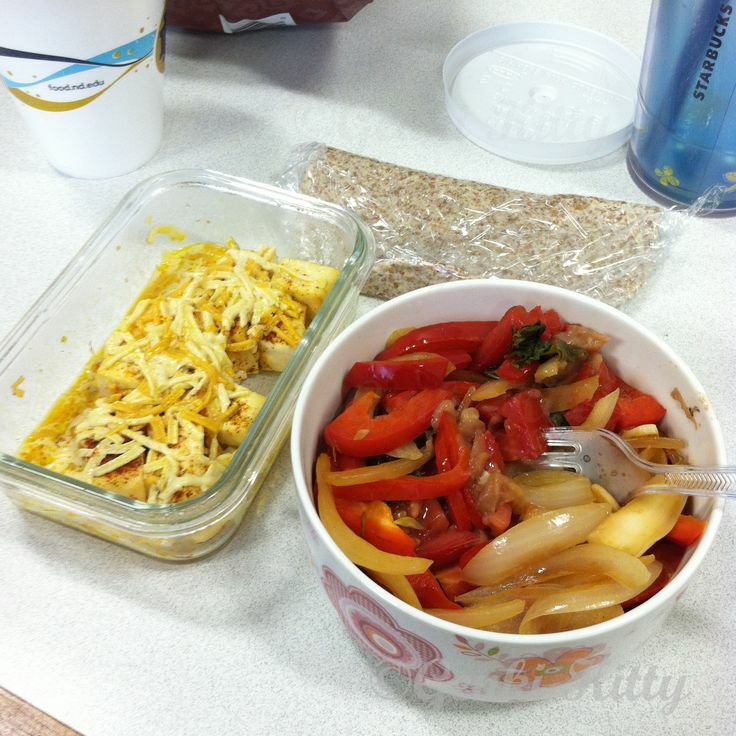 It’s super easy to put together and tastes just like the animal meat but without the guilt. We would definitely make this again. Original recipe here. Oh my! Pudding is a dessert in America that is quite popular, hence, it is hard to omit when going vegan. Boxed pudding mixture is not vegan, unless it is noted on the outside. Thankfully this recipe takes advantage of very soft tofu that has very little flavor so it takes up the seasonings added. I actually made this for Genki Husband’s breakfast thinking it was not going to be super sweet (since it’s made from tofu). Was I wrong or what?! This is super sweet and we found it was more of a dessert than actually a breakfast dish. Now if you have a super sweet tooth in the morning, you might like it – who am I to judge. Thankfully it does have a good amount of protein in it, since it is from tofu. 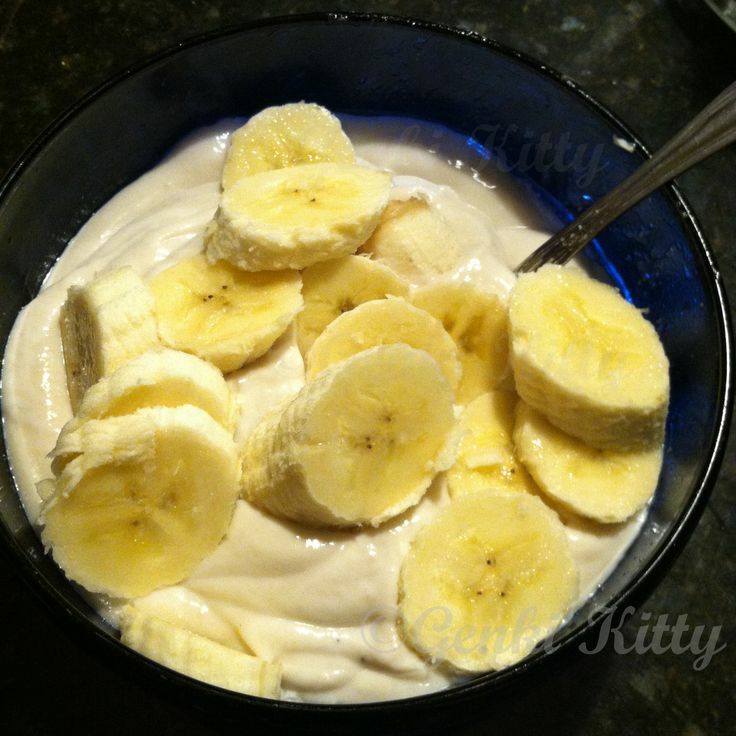 I would imagine you could make banana pie from this easily since it has the spot-on flavor. There are times when I send Genki Husband off with leftovers from dinner the night before that may not have enough for a full meal. So he has a stocked office full of food options that can be warmed up on such an occasion. 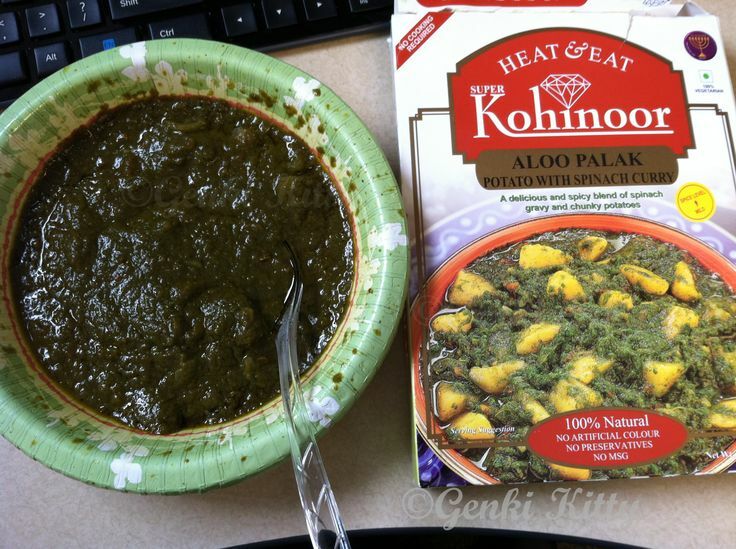 The other day he tried this Kohinoor Instant Indian dish – Aloo Palak. 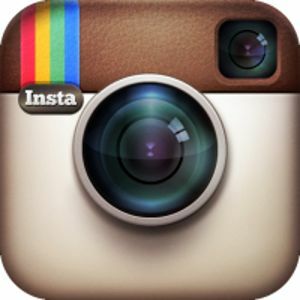 The photo looks absolutely delicious doesn’t it? (if you love Indian food hehe) Unfortunately it came out of the box like a green gooey mixture that was very unappetizing in appearance. The photo suggests there is potato chunks but it was basically just a green soup. Even though it had about 300 calories per serving (a box contains 2! ), he said it was not filling. I’m assuming there was a lot of oil in it that upped the calorie count. He asked not to have it again so we would probably have to skip this next time we see it. 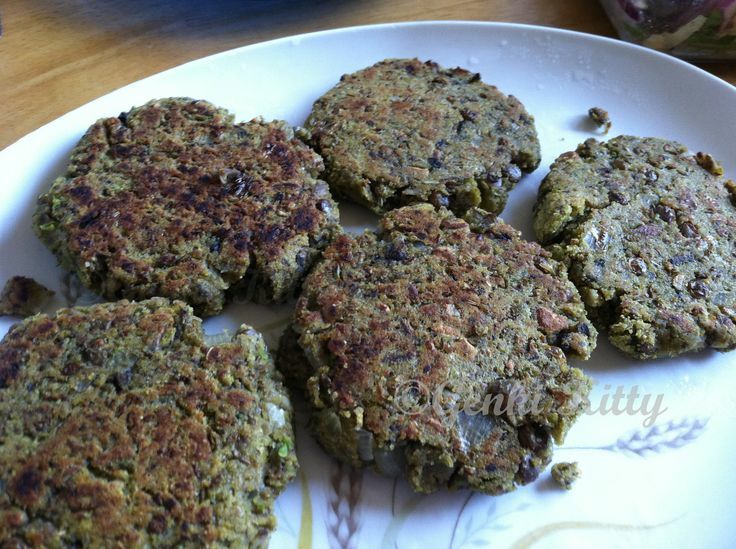 Chickpea burgers I made but did not turn out. Sometimes it works, sometimes it does not. These were rather plain and just did not have anything that kept our interest. 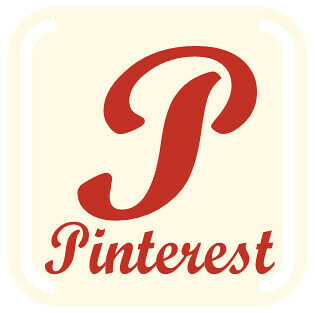 Sometimes recipes just don’t work out, one never knows until a trial has been done. I’ll save you from having to read this recipe, it was just that bad. Some weeks I don’t feel like making a grocery list which most of the time isn’t a great idea but sometimes it works out for new recipes. On one of these weeks I tend to go to the store and Genki Husband and I just pick out whatever looks good in the fresh produce department. Then we combine the ingredients which what is already stocked in our kitchen pantry. This week I put together one of Genki Husband’s favorite dinners, Spaghetti. I actually do not like spaghetti – it’s always been one of the meals I would turn my nose up when my mother made it as a child. But now that I am older I make it for G.H. and then only slightly turn my nose up. Don’t worry, I’m leaving you hanging in suspense for the recipe. It’s rather simple, I tend to toss in a ton of freshly chopped tomatoes (best in the fall when tomatoes are basically given away), onions, garlic, capers and a little leftover pasta water. I let it all simmer for about ten minutes or so before putting in the almost done pasta. I learned this trick from Lidia’s Italy when making homemade sauce you put your almost finished pasta in the sauce the last few minutes. 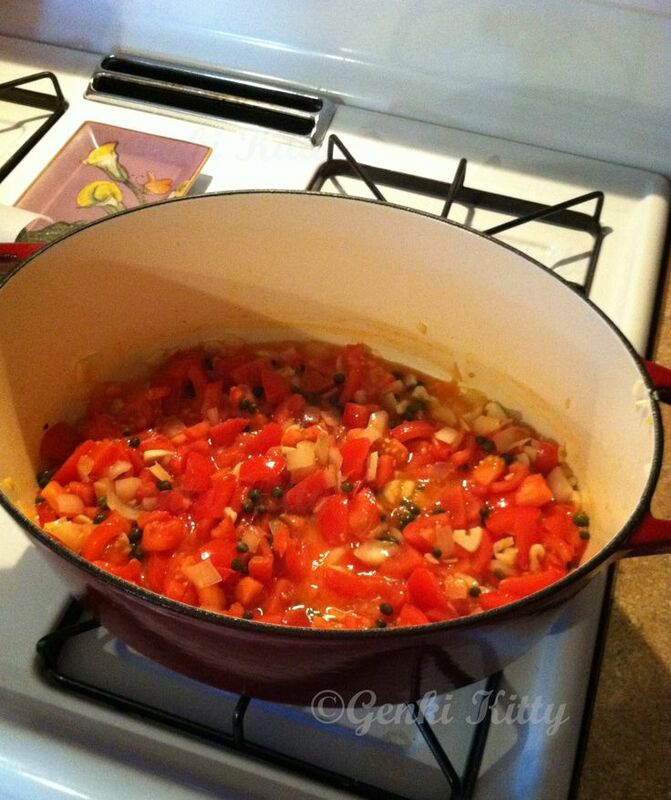 This not only cooked the pasta the rest of the way but also thickens the sauce by absorbing the extra moisture. 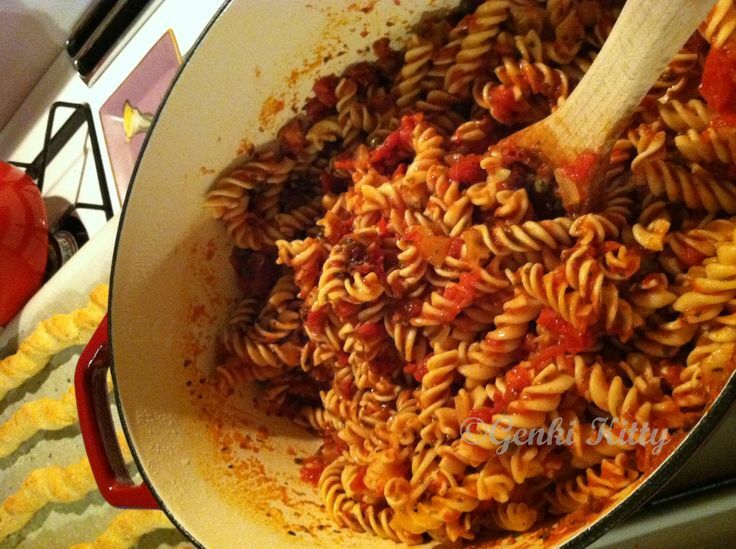 The pasta just absorbs all those extra flavors and makes the dish perfectly rounded. 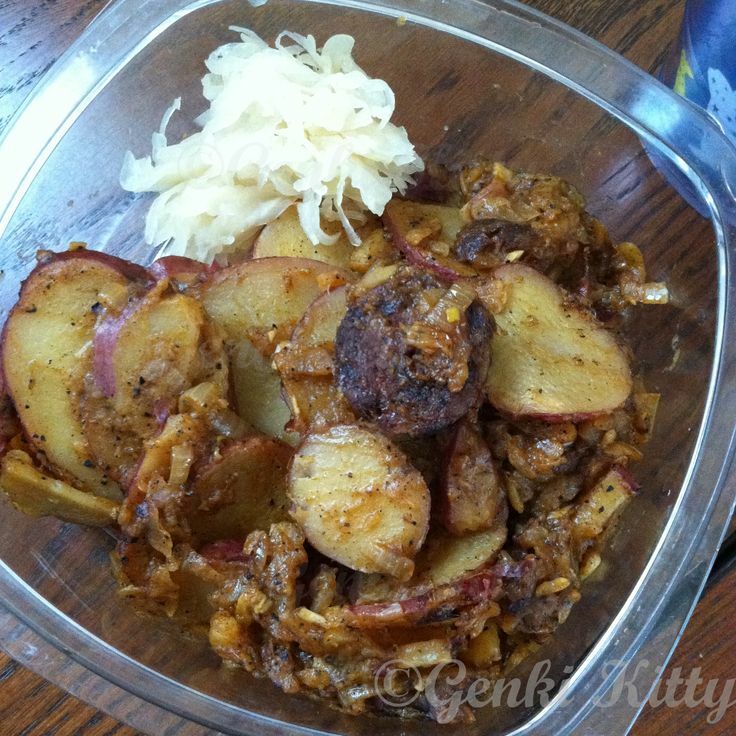 Hungarian Stew! Yes, please!!! This is a dish I used to make a lot in the winter months while in Virginia. 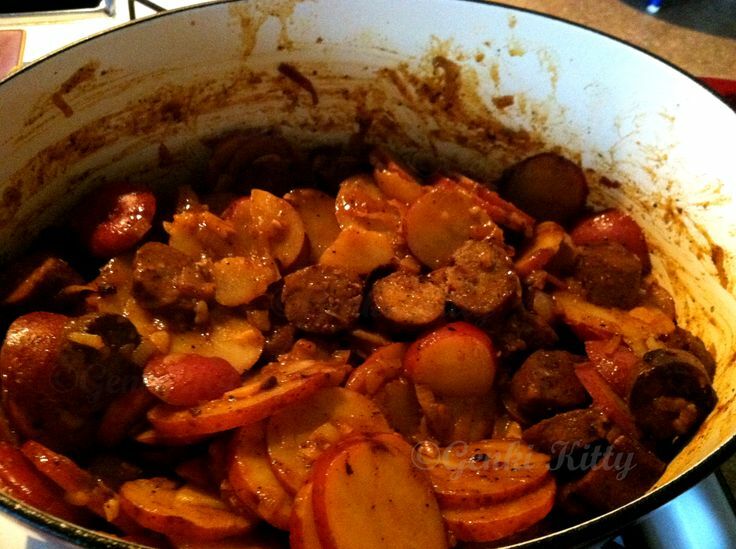 It is super easy to put together and just bursts with flavors. We would highly recommend this recipe to anyone! 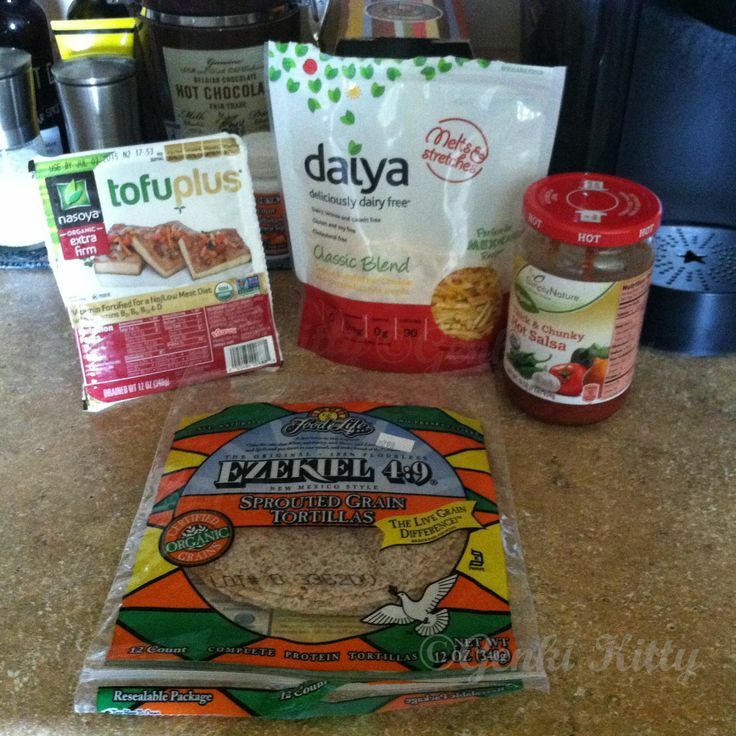 Remember to use vegan sausages – homemade or store brands all work out great! Original Recipe Here. 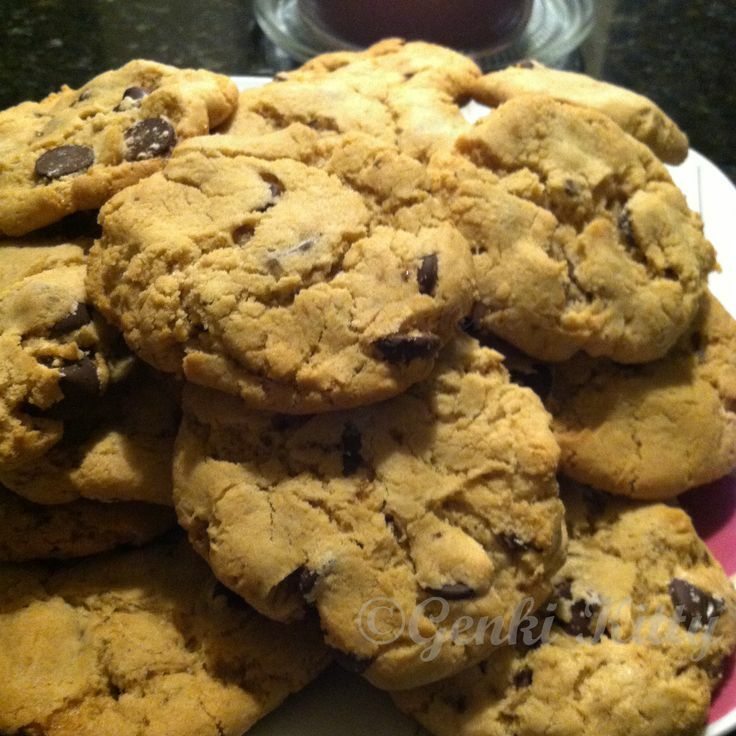 Espresso Chocolate Chip Cookies – for Genki Husband and his colleagues. Everyone absolutely loved these cookies – only G.H. 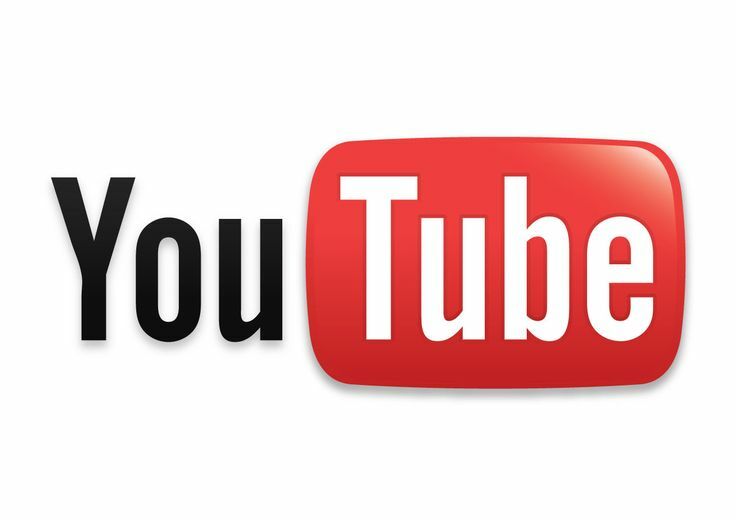 is vegan. Simply take your original recipe for chocolate chip cookies and add about 2 tsp- 1 tbsp instant coffee granules. It works wonders in rounding out the flavor – it’s not over powering in coffee flavor. 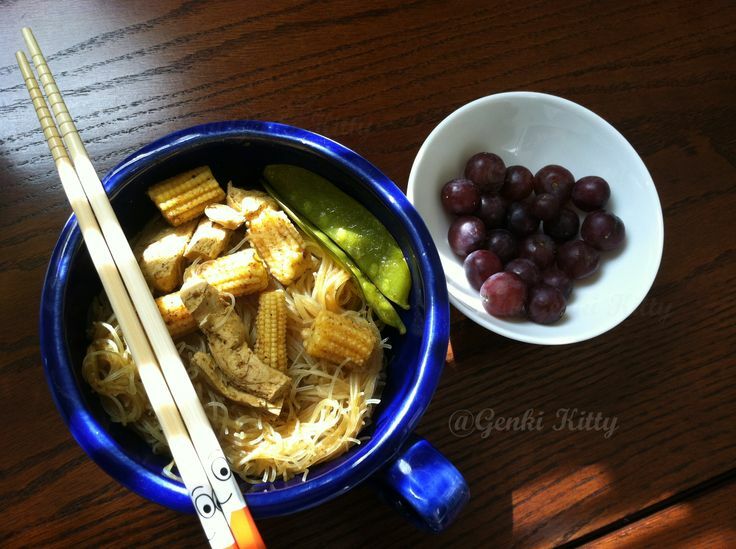 Chinese Ginger Noodles with mock chicken and a side of grapes. This is really easy to put together and if you have a stocked up kitchen with Chinese ingredients you can easily make this from ingredients in your pantry. A perfect end to a gorgeous spring evening with this color-filled salad. It was easy to put together and I assume would be even easier if you purchase a package of coleslaw from the store and mix everything else up together. I love to work the knife so I did everything by hand but that’s just my choice. This is a great recipe for a warm summer night when you don’t feel like firing up the grill. Note: I did not use the cashews and it all worked out fine. 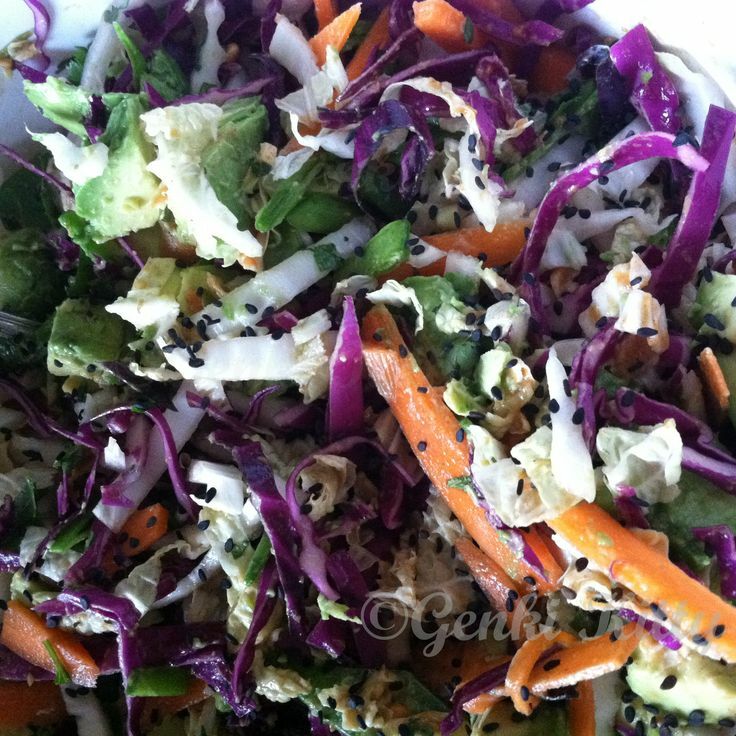 Crunchy cabbage salad with spicy peanut dressing Original Recipe Here. Wow, you guys have been eating well!!!! Except the Kohinoor stuff :p My mom gave me a bunch of boxes of it, and yeah…there’s not much actual food in there, they recommend serving it with rice. The chickpeas are always a disturbing gray color. I have a few boxes still sitting here at work for emergencies, but usually I’ll just go hungry rather than eat them! Oh so it wasn’t just us! haha We were wondering if it was just this type or not. The idea of grey chickpeas though, not very appealing.